One of the things that makes a good comic book great is when the characters are treated with love by their creators. Sure, you can have an addictive series that keeps people coming back year after year, but it seems to me, especially now, that some of the heart has gone out of the modern comic book. More flash and hooks than actually caring about the stories being told. The typical issue I pick up these days feels like popcorn. I love the rush of the spectacular art, and the state of color separation. Its never been better than today. But, after its over… A little part of me feels empty. I don’t feel as connected to the characters as I used to. I don’t need the gimmick of a broken spine or a mind swapped hero, I want to see into the heart of the characters… If you’re missing that too, then here’s one for you. 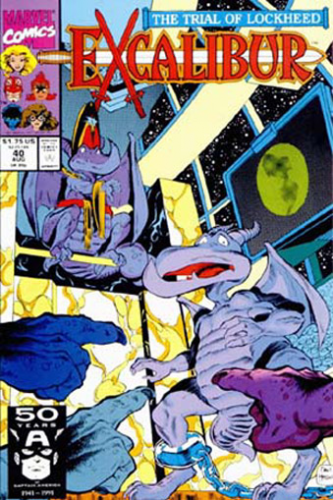 This week’s Back Issue Bin to the Future takes us to Excalibur #40. This issue opens with Lockheed, Shadowcat‘s draconic companion, laying on an operating table while the Excalibur team looks on from an observation booth. Kitty Pryde watches helplessly while Kurt Wagner, Nightcrawler, puts a hand on her shoulder. With a “poik” sound, Lockheed opens his eyes and looks down at his body. He wonders, in humorous rhyme, if he is dead as he gets drawn to a ship in space. He finds its run by members of his race. They put him on trial for breaking their “sacredest of laws,” abandoning the community. The penalty is death, should he be found guilty. To defend himself, he gives an endearing origin for each member of Excalibur. His tale puts a number of the crew to sleep, including the pilots, but he rights the ship before any harm is done and returns to be judged. Seeing as he has just saved them all, they show mercy on him and exile him instead. The story is heart felt and humorous, being told almost entirely in “Dragon-speak” which the editors were kind enough to translate for us. Although at one point, the rhymes don’t quite work, they point out with another editor’s note that it’s only a loose translation after all. We even see the dragonette that he left standing at the alter so he could run off and join Excalibur. The “Dragon-speak” is definitely the best part of this issue. It sort of strikes me like a child’s story book written by Shakespeare. The writing comes from Scott Lobdell. I never much cared for the Excalibur series even though it had three of my favorite characters, Shadowcat, Lockheed and Nightcrawler. Shadowcat and Lockheed in particular. But this issue has held a place near and dear to my heart ever since I was a teen. Giving Lockheed a voice and showing us his people and culture, if only briefly, was immensely entertaining and endearing. It was one of those moments that I really treasured, a break from the action, a chance to get to see the characters from an entirely different perspective. I miss that, it seems like the need for action is so forced we don’t get the chance to learn about them more than as one dimensional ‘power sets’. Its okay to break up the action and just let us see how our favorite characters deal with the more common aspects of life. It gives them heart and depth. Parental Concern: No violence to speak of unless the image of an unconscious Dragon on an operating table disturbs you, or the concept of the death penalty isn’t something you want to explain to your preteen. I think the humorous tone of rhyming Dragon-speak makes it clear that there’s nothing to fear. Just a heads up. Kurt Wagner is Nightcrawler. Kurt Connors (might be Curt) is The Lizard. I always felt that this issue was a weak entry in a great series (especially since it was 2 issues before #42 where Alan Davis came back (this time as both writer and artist) and brought some life back into the series. Then again, very few writers have ever really done justice to Lockheed. So it can always be forgiven for that. Nice catch! Also, clever name.